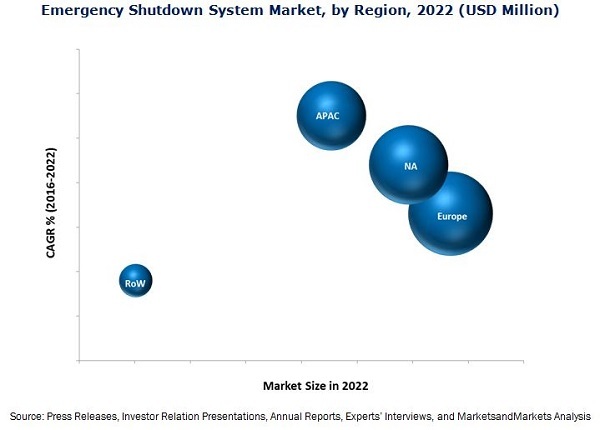 The overall emergency shutdown (ESD) system market was valued at USD 987.0 Million in 2015 and is expected to grow at a CAGR of 9.1% between 2016 and 2022. The base year used for the study is 2015 and the forecast period is between 2016 and 2022. This report provides a detailed analysis of the ESD system market based on component, application, and region. It has been estimated that the safety sensors would hold a large share of the ESD system market. However, the market for programmable safety systems is expected to grow at a high CAGR between 2016 and 2022. The stakeholders of this report include technology providers; semiconductor product designers & fabricators; raw material & manufacturing equipment suppliers; research organizations & consulting companies;, associations, forums, and alliances related to process instrumentation; government bodies such as regulating authorities & policy makers; and investors. Key players profiled in the report are Rockwell Automation (U.S.), Schneider Electric SE (France), Emerson Electric Company (U.S.), Siemens AG (Germany), Honeywell International (U.S.). This research report categorizes the emergency shutdown system market based on method, industry, and region. With the given market data, MarketsandMarkets offers customizations according to a company’s specific needs. The following customization options are available for the report. The overall emergency shutdown (ESD) system market is estimated to reach USD 1,816.0 Million by 2022, at a CAGR of 9.1% between 2016 and 2022. Rising demand for safety systems in the oil & gas industry and implementation of regulatory measures by several governments for industrial safety are important factors driving the ESD system market. The oil & gas application accounted for the largest share among all applications of the ESD system market, followed by the power generation application. Safety is the most critical concern in the oil & gas industry. Lack of proper safety systems in the oil & gas industry may lead to production loss, stress on affected components and systems, and hazards during system restoration. Therefore, the market for ESD systems is expected to grow in the oil& gas application during the forecast period. In 2015, safety sensors dominated the ESD system market based on components, followed by valves. Safety sensors are used widely in safety systems for different applications such as to sense movement and position, track tooling data, and help integrate automated systems. The market for ESD system based on components the programmable safety systems is expected to grow at a high CAGR during the forecast period. Programmable safety systems are relatively new and developing rapidly. They are flexible to design modifications, highly efficient, easy to install, highly reliable, and highly secure. These advantages of programmable safety systems have triggered the growth of this component in the ESD system market. Europe accounted for the largest share of this market in 2015. A large-scale production creates the need for more intensive control of a process, especially with regards to its efficiency and safety; and this drives the ESD system market in the European region. The ESD system market in APAC is expected to grow at the highest CAGR between 2016 and 2022. With growing industrialization in APAC, increasing industrial and machine safety emphasis by the organizations and influence of multinational companies in adoption of safety systems. Moreover, a healthy growth of ESD systems is expected in the oil & gas application with a number of greenfield projects being planned in countries such as Indonesia and Malaysia are driving the demand for ESD systems in the APAC region. One of the key restraining factors for the growth of this market is complexity of safety designs and lack of awareness regarding standards. Lack of awareness regarding safety standards among end users who adopt safety-instrumented systems and technologies is one of the major restraints. Personnel present on plants and factories are not yet aware about the type of safety devices and standards available to safeguard the machinery and labor. Some of these plants and manufacturers do not have safety experts to determine the possibility of safety devices required in each machine or process. Rockwell Automation held the leading position in the ESD system market in 2015. The company is the leading provider of industrial automation power, control & information solutions. The key elements under architecture & software segments are the automation control and information platforms, software applications, and automation components. Its major revenue contribution comes from the architecture & software segment. Additionally, to sustain its leading position and ensure its future growth, the company adopted several other strategies such as new product launches and acquisition.